Series devoted to saving treasured heirlooms from the scrapheap. In Chatsworth House, Derbyshire, Eric Knowles and his team of brilliant restorers take on every challenge. and maybe make a little bit of money along the way. 'This is Chatsworth, a majestic 450-year-old estate set in the heart of the Peak District. 'It's a picture-perfect venue for today's Restoration Roadshow. the price tags are in the £4,000 to £5,000 bracket. Wow, look at this! It's got to be restoration. It's got to be conservation. 'Will the items go home or be taken to auction? the their tiny hands back is going to be a major operation. a map of the Western Front. He must have carried this around with him in the trenches, looking at the state of it. 'We need to preserve it for the brave soldier's granddaughters. No, don't show me any more. I can stand the look of it. 'Can we save this French gilt chair that's had the stuffing knocked out of it? 'Chatsworth is a grandiose mansion with attitude and pulling power. 'with their motley collection of treasures old and new. 'I'm taken by this fabulous 19th Century ornate gilt chair, brought by Mel Dexter. I don't know about the word restoration. I think you chair is in need of first aid. Not quite open heart surgery, but it's in a bit of a state, isn't it? -Was it in this state when you inherited it, or did you buy it? I bought it in Paris at an antique market. And I thought it had got potential. -But I stuck it in the garage and it's been there ever since. What a comedown for this beautiful ornate chair. during the reign of Louis XIV, back in the late 17th Century. What did you pay for it? That's what I need to know. Money very well spent. I reckon it's got to be worth two - minimum, as it is. absolutely the bee's knees, you could be, you know, £350, £400. he needs our textile man, Rick Turner, to get it into a state fit for a king. When it comes to upholstery, Rick's the ruling champion. to restoring vintage cars from Rolls Royces to Aston Martins. so are you going to need an awful lot of scalpel work on this job? That's full surgery, I'd rather say. It's got to be completely restored, everything taken off. Underneath I see there's a board, so that's got to come off. -So you'd expect webbing under there? So that's all absolutely had it. Once you take that off, we'll be stripping the webbing off, ripping the seat out completely. -I'm just thinking of the Grand Cinema on a Saturday morning. I was sat on that stuff. No, don't show me any more. I can't stand the look of it. -OK, so what sort of money are we in for? -I reckon about £250 or so. that it'll be money well spent? I think so. It looks like we are in safe hands. 'You can be sure of that, Mel, because at the moment, this chair's worth around about £200. 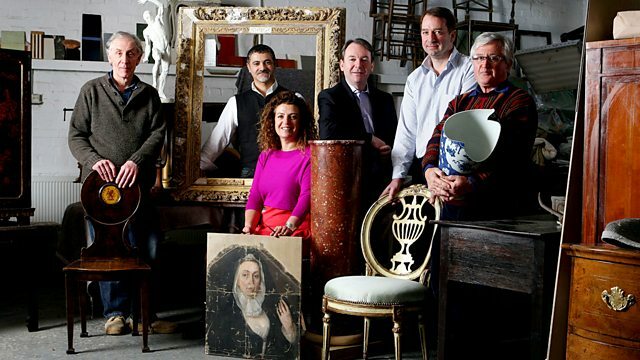 'Mel could see his chair fetch up to £400 at auction. 'Our restorers are already tending to the first casualties of the day. 'Next up is an incredible trench map from the First World War. 'Preserving it will call for someone with specialist surgical skills. 'who's worked at London's Victoria and Albert Museum and helped save many a work for the National Trust. 'This map has certainly seen a lot of action and survived life in the trenches, but only just. 'It belonged to the grandfather of Yvonne Culverson and her sister, Marie. So it means a lot. -Do you want to see a photograph of him? -and then he was gassed in December 1917. Sent back to England to convalesce, got married in the March and then got sent straight back again. 'This map dates back to January 1917. 'Over 6 million lives were lost in the Great War, with a further 14 million injured. 'coming under constant attack from snipers and shelling. 'It beggars belief that this map survived at all. I would recommend three things to do to this. because we've got lots of ingrained dirt and surface deposits. that's actually causing these fractures to become worse. and reinforce this loss and perhaps any weaknesses in the folds. It will be much more stable. ..just to stabilise those areas and flatten out this deep creasing. Yeah, that would be lovely. 'Louise, you really have your work cut out with this one. 'It's currently worth around £50 and Louise will expertly tend to its injuries for £150. 'This map isn't going to go to auction and the truth is it won't go up much in monetary value. 'But it holds real sentimental value for Yvonne and Marie, and you just can't put a price on memories. My grandma took it from China to Hong Kong. -He's starting at the top end. 'And Rick's going flat out to give this 19th Century gilt chair the majestic seat it deserves. 'But will his hard work be royally rewarded when it goes under the hammer? It's fairly obvious that there are a lot of scuff marks and scratches here. It's worth spending money on, it is a really pretty box. The workmanship in that is fantastic. 'Christine Bird has turned up with an injured pair of early twentieth-century nodding figures. 'Restoration paramedic, Roger Hawkins, is charged with rebuilding their missing limbs. and his reputation has taken him as far afield as Hong Kong and America. They're absolutely typical German nodding figures. but they're actually called bisque figures. And that referred to the fact that they just have a first firing and they're not glazed. It's actually a French term and it means biscuit firing. Have you any idea of the age? They have to be over 100-years-old. imaginable that these were from that date, so absolutely spot-on. And were they always broken like this? Yes, I've never known them with the hands on. put the hands back on and you'll never know they'd been damaged. be wanting to keep them, will you, because of the sentiment attached? Yes. They belonged to my father's cousin and they were his mother's. In auction, if these were perfect, you would expect them to fetch between £30 and £40. to make those hands would probably cost in the order of about £80. Now that is more than they're worth. You have to decide whether the sentiment attached to them is worth you spending that £80 on them. I think it would be nice to have them done. Sadly, these little figurines aren't worth much at the moment. Roger wants £80 to restore them. if she took them to auction. many of you aren't motivated by money. It's sentimental value that counts. Let's hope Roger's efforts will meet with the approval of these figurines. All work and no play make our restorers such a happy bunch. Let's open it up. Oh, look at that! Great, what a difference! Wow! But they're not the only ones hard at work. Chatsworth is also undergoing much-needed restoration. Behind these huge tarpaulins, some specialist undercover work is going on. restoration and renewal of large parts of this building. Part of the huge undertaking is giving the stately home's exterior a good old scrub. And it's producing some great results. smoke, soot and bringing it back to this incredibly crisp original colour and condition. These really do look brand new pieces of stone, as though they were quarried yesterday. But in fact, they are 300-years-old. 'while Louise has locked itself away to preserve Yvonne and Marie's important piece of heritage. 'It might be broken, hidden under the bed and a family heirloom, but is it worth restoring? 'Wei Ling Gi has a case in point. I have to admit that, at first appearance, I thought it was lacquer. But I notice it has been stitched down the side. It's actually covered in leather, in hide, isn't it? Date-wise, it must be some time in the 1920s. I think my grandma took it from China to Hong Kong after the wedding. I think that's why it has been used, actually. It's not been well kept. -So it's been a working trunk? -Can I have a look inside? -It's not locked, is it? So it's quite simple inside. I don't think there's an awful lot you can do to it. -Do you know what it's worth? -I've no idea at all. Right, well, personally, I don't think it's going to be worth an awful lot. As it is, it may be worth £30 to £40. You need to just give it a little bit of attention. What I would recommend is a tinted beeswax. with a bit of beeswax, you may find yourself getting nearer £50 or £60. Is it something you are thinking of selling? Well, I wouldn't mind to sell it because I haven't got much room to put it in at the moment. 'So it's off to the auction for this oriental 1920s chest. 'and give it a little polish herself to improve her chances of getting £50 to £60 at auction. -Oh dear! Two headless figures. 'But, while new treasures keep coming in, Rick's been working away on Mel's worn-out gilt chair. 'He's already taken the board off the bottom, replaced the old webbing and reattached the springs. The next process is to actually start putting the horse hair in these pockets. Go all the way round. Horse hair's brilliant, because it's very springy. It gives a good edge roll as well. a lot longer than modern ones. 'I suppose there is no arguing with that. The chair's lasted this long. A little bit of felt on top, then calico, then the cover. So it's quite a lengthy process. It's going to be brilliant when it's finished. 'Remember that wonderful First World War trench map belonging to Yvonne and Marie's grandfather? So I'm just preparing these edges. They've been slightly reinforced at the back with a very fine cotton tissue. which have all the detail on. They've got the roads, there are various farms and villages. I'm just basically preparing this section so that it can be married up with the rest of the map. 'It's an exact science, aligning the pieces with all the map details to match up. 'With that done, it's the turn of the holes. 'Now that looks like a job and and a half to me. This material here is a polyester that we use. I'm just going to come over a couple of millimetres, because the edges are so friable. I just want to make sure that this patch is well attached. So I've made a shape so I can easily trace through using my tissue. at the edge so that they can latch on to the edges of this loss. 'Now that's clever. It's just like darning, but with paper. 'I'm amazed such a delicate medium can be conserved like this. Here's some epoxy resin filler, and I have to make from this a hand. Now the hands on these figures are, fortunately for me, fairly crude. So stick it on there and see whether it looks about right. to make the little finger tip, and that's already a little hand. 'You've got to hand it to Roger, when it comes to ceramics he really is top dog. 'But will Christine agree when she sees her reconstructed figurines? 'Back at Chatsworth, and it's that all-important Restoration Roadshow moment. and he's certainly put in the hours, so how are we feeling here today? -Let's see what you get for your money. Oh, wow. Yeah, that's fabulous. Rick, I've got to say, how on earth did you manage to bring this chair back to such a wonderful state? porous in places so I had to use a staple gun here and there. 'Well, whatever Rick's had to use, it certainly worked. 'Before, the bottom of the chair was held together by an ugly board. 'Rick's replaced it with webbing and covered it in new material. 'The edges were stained and rusted, but now they have a delicate trim. 'but the horse hair stuffing has plumped it right up. -Where's my chair? I love it. -You do, you love it, but you're thinking of selling it? -As much as I love it, I really want to sell it. -You're going to stick to your guns on this one? -I am, yeah, go for it. -The odds are stacked in your favour, I think. 'Meanwhile, Roger's been carefully crafting new hands onto Christine's early 20th Century figurines. -You're looking forward to, yes? -This is the hand you've put on, isn't it? I can't remember which one, was it that one? Don't you know which hand I've done? -No, that's a testament to your work, isn't it? -I think it's that one. -That's right, yes, that's the one that was off. 'seemed destined to be disfigured for life. 'But Roger has given them back their hands, and they're perfect. 'It really is quite impossible to tell which ones are new. and they are, whatever the value, a family heirloom, aren't they? I have to say, our restorers have worked like Trojans today. I'm really chuffed, and seeing all the wonderful reactions they've inspired makes me feel warm inside. Here are some of the treasures that have benefited from their handiwork. and can nod to their hearts' content in her living room. a royal palace, and the Wei Ling's (????) grandmother's leather chest. All it needs is a bit of spit and polish, but will it bag any bidders when it goes under the hammer? that Louise has spent hours painstakingly piecing together. -So before we draw back the curtain, how are we feeling, ladies? Very excited, it's fantastic, yes. -That's so much cleaner than it was before. -all the bits that were missing, and you can just see so much more of it. Before, this map was being assaulted on all fronts. It was full of holes and the folds were coming apart hiding the minute details. of towns and villages, but, most importantly, its deterioration has been stopped in its tracks. map that's literally been through the wars. You can still see the folds, but they're not crumbling any more. No, she's done an amazing job on it, hasn't she? This has cost you how much, ladies? -because this has been in your family for almost 100 years. It just looks stronger and like it's going to last. So have I got two happy ladies? It's auction day Bamford's in Derby. on offer and limber up for the specialist sale. We have just over 500 lots this morning. First up is Mel's 19th century gilt chair. Even in its sorry state, I valued this ornate chair at £200-250. I reckon it deserves to get £400 at auction. A nineteenth-century France giltwood saddle(???) corner chair, really nice thing. He's giving it be good push, isn't he? I can start at £270. 280 do I see? -At 290, it's still with me, 300 do I see? -No, it's worth more than that. -All done then at 290? I'm afraid that remains with me, not quite there. -Yeah, me too. I mean that's worth all the money. There was obviously some interest there, but it just waned. Are you happy to take it back? I would be really happy to take it back anyway. It's been given a new lease of life, hasn't it? Yeah, and it'll sit really well in my sitting room anyway. Next up is Wei Ling's leather chest, and she's brought along her partner, John. You've spent no money at all on having the thing restored? -A bit of furniture polish. A bit of furniture polish, who did that? -Oh, you did that, did you? OK. When I first saw it, I thought the chest was worth £30-40. All it needed was a bit of buffing to make it worth near £50-60, but are those bidders out there? -Lot number 170. An early 20th century Chinese lacquered rectangular linen chest, great lot. 30 then, let's start. £30 bid. Yeah, we've got a buyer at 30. We want a buyer at 35, we want a buyer at 40, don't we? It's going, it's working. Come on. At £60, all done and selling at 60. I was sad to let it go, but you can't keep everything. -And they are rather bulky, to say the least, aren't they? It's obviously going to find itself a new home now, isn't it? -And you're OK with that? I'm OK, I'm quite happy with that. I hope they enjoy it as much as I have. if your tired antiques can make some money here on Restoration Roadshow. In wonderful Chatsworth House, paper conservator Louise Drover battles to restore a First World War trench map that has definitely been in the wars. Meanwhile, ceramics genius Roger Hawkins is forced to perform delicate surgery on some fragile 20th-century figurines, while upholstery expert Rick Turner gets stuck in to a 19th-century gilt chair that has had the stuffing knocked out of it. But at the end of the day will their efforts be rewarded? Will the owners be happy with what they see? And if any items go off to auction, will they steal the show and make a pretty penny?